Classy huh? I know you all can't wait to add this to your list. Then we went to a birthday party & my overachiever friend, LA had graham cracker "gingerbread" houses for the children to decorate. I usually let my children make a gingerbread house from scratch from one of those Wilton kits, which ends up with a fight, some Xanax & a huge mess for me to clean up; so thanks LA. Gingerbread houses- check, check, check! I think they turned out pretty cute. and some people (Baby Girl) may or may not have had help. In the past week, 2 of my friends have lost parents. Retro & I are in a vast minority among our friends; both sets of our parents are still alive & still married to each other. I think in this day & age that says a lot. 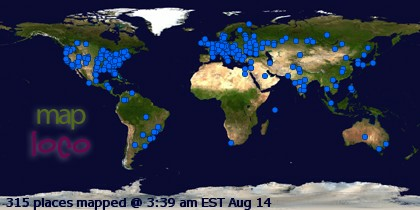 We are very blessed. I loaned my friend who lost his mother my Xanax, besides my sympathies & some chicken & dumplings, that's all I could offer him. My other friend lost her step-father (& my neighbor). His family is scattered around the country & a very outgoing group. They are Catholic & of Latin American descent & apparently know how to party. The evening after the funeral the family held a party in Mr. Tony's memory. If any of my IRL family or friends are reading this, I totally want to go out like this. Cocktails & Karaoke. Now isn't that a great way to celebrate someone's life? The other day I found a box of Andes mints that I bought to go in Bo's stocking last year. I was wondering where I put those things. 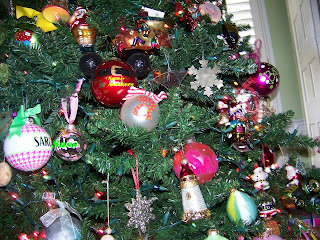 And the bad thing is that they weren't packed up with the Christmas stuff, they were right beside the TV in the armoire. I'm getting ready to write a review for ScentSicles. They are fragrance sticks that you hang on your fake tree to make it smell like a real one. How clever is that? 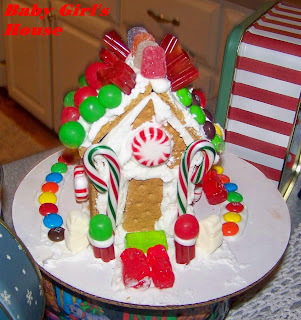 The kiddos did a great job on the gingerbread houses! I'm still waiting to find some "pre-assembled" ones so that all Alise has to do is actually decorate the darn thing! 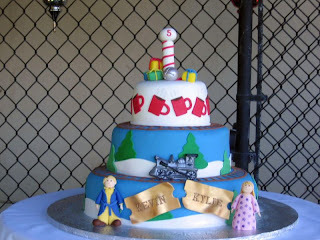 No help with the Polar Express Party, but for what it's worth, I think it's a GREAT idea for a December birthday! And at first I thought I read that your friends' dad was "scattered across" meaning his ashes, so of course I had to go back and re-read that it was hit actual family. Whew! Caaaaa-ute Gingerbread houses! Oh, and Hubs and I still have both our parents and they are still married, too. And everyone I know has specific directions to have a Par-tay after my funeral.... it's only fitting! Love the gingerbread houses. Classy shirt for sure. I am sorry to hear about your friends' losses...seems to be the season for it. I have pine spray for my fake tree! My son is in the minority too - his parents are married and his grandparents are all still married too. my hubby is in the minority...but i have to explain to my girls why they have so many grandparents in the States on my side. Ugh! I forgot about gingerbread houses. Now that my oldest is 3 I bet she would like doing that, so thanks! I also never thought about making my fake tree smell real....as long as the scents are done right that would at least take away the baby diaper smell from my house, right? My Dad and David's mom are both gone. It makes this time of year so, so hard. I had a pretty bad weekend because of it. Today I'm kind of just soldiering through. I mean, that's what we do. Right? My thoughts and prayers to your friends and their families. I'm so with you ... I want my life to be celebrated not cried over when I do go "Home". And never mind the you can't take it with you .. 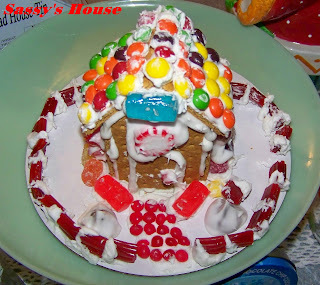 I have added a few items including a little something to keep my little toes in style ( Jimmy C. and a pair of Manolos)..
All 3 gingerbread houses are brilliant .. way to go little ones!!!! OMG... that shirt is awful!!! I'm sorry about the losses in your life.. =/ the holidays make it so much more difficult.. I'm kind of hurt that you didn't like my shirt. I mean, I wore a shirt AND shoes....what more can you ask of me?? 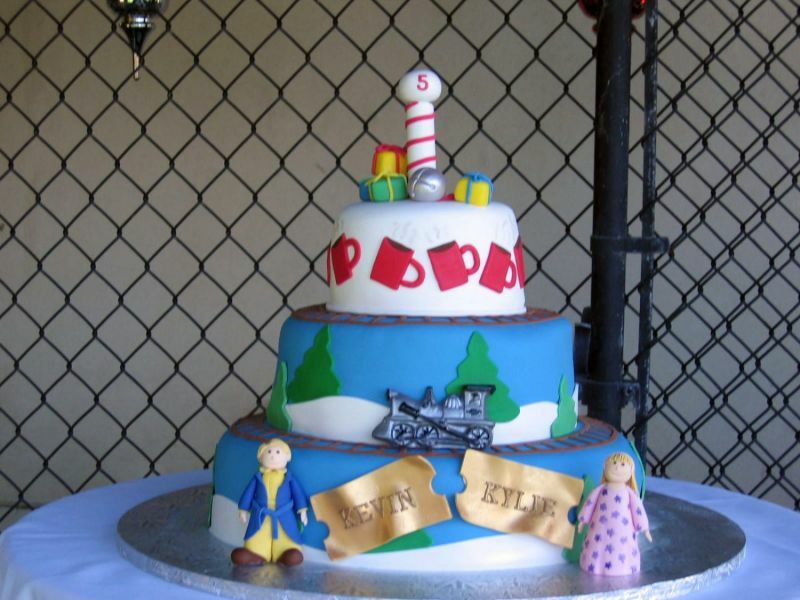 I love that Polar Express cake! I'm just love the party theme for Bo's party! the cake will be perfect. 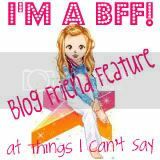 Reading your blog seriously makes me want to pack up my house, head South on I-75 and move into a small town in GA! Who knows, maybe we will someday! Love to read your posts. So i was thinking about all the elves at the North Pole. How about minature size food, mini burgers, dogs, pizza? elves can't eat big food and minis seem to the be new rage. just a thought. Love, love, love the cake idea. Awesome. Sounds like it's going to be a great party. Haha...I was totally going to ask if Baby Girl got some help! I like the idea of graham cracker gingerbread houses! OOhhhh... 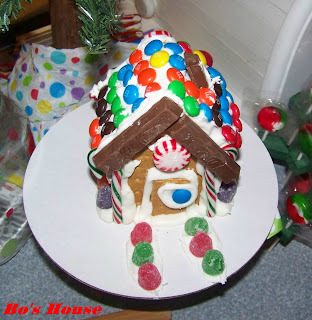 I can't wait to make Gingerbread houses!! The pics of them, made me all giddy! I am excited to see and hear all about the bday party. Shirt - bad. Houses - good. Deaths - sad. Death parties - interestingly cool. Scented fake trees - GENIUS! Do you think my husband would be offended if I bought him that shirt for Christmas?